Archives of Eaton Bray News for October 2012. We were delighted to be informed that our application to become a Primary School has been successful. Our School is in the village of Eaton Bray which is positioned between the two towns of Dunstable and Leighton Buzzard. The School is in a wonderful setting along a quiet lane off the beaten track. Our children remain children for as long as possible and our School is still small enough for us to have good relationships with each other. Although we thoroughly enjoy our 'out in the sticks' location we make sure we keep in touch with what is happening around us. Having been judged "Outstanding" by Ofsted in 2007, we became an Academy on 1st April 2010 – yes we chose that date deliberately - and now we have permission to change our age range and become a Primary School in 2013. These are uncertain times for education in Central Bedfordshire. We opted for Academy status so that we could take what we know are the right decisions to determine the school's future, and always with the children and their future at the centre of that decision making. One of the first comments that usually arises about Academies is that becoming an Academy allows a school to be selective about intake - at Eaton Bray, this is firmly not the case and we have always been very inclusive, welcoming children of all backgrounds. To increase parental choice – offering greater options for children's future education, including offering the 11+ exam option to those who want it. We consulted our children and parents, and a strong majority want to stay beyond age 9 (year 4). "I believe that the children would benefit from the stability of a primary school where their specific learning needs are already known and can be built on, rather than interrupted by having to move to towns some distance away." "As a family we fully support both the School Governors and Mrs Hounslow. We think the school has already exceeded our expectations as a nurturing, encouraging and holistic educational establishment." "I agree that Eaton Bray Academy should change its age range from 2-9 to 2-11. The school provides a unique environment for children's education and has room to provide more classrooms without impacting on the school's grounds. I am sure that many parents will be pleased for their children to remain at Eaton Bray until they are 11 and havecompleted Key Stage 2." "Full support for this based on great success, and continued progress and improvement of Eaton Bray School. In consideration of changes in the county and district in general, I believe this would give stronger cohesion to the village community, greater parental choice, and, most importantly, improved educational outcomes for the children." "I fully agree that Eaton Bray Academy should change its age range from 2-9 to 2-11. I cannot think of any better environment for children to be nurtured in!" Our local Member of Parliament, Andrew Selous was also very supportive. The School will become a Primary in September 2013 so our current Year 4 children will have the opportunity to remain in their familiar setting and move into Year 5. The following year this same class will become our first Year 6 class. The Trustees, staff and Governors of Eaton Bray Academy are dedicated to maintaining and improving standards for pupils who attend Eaton Bray Academy. We believe that continuity of learning through Key Stage 1 and 2 is best achieved as a primary school. This change would bring us into line with the education system in the rest of the country. We are of the opinion that it is in the best interests of our School and the village community to affect these changes as soon as reasonably possible, to avoid being "left behind" as inevitable changes take place within the educational system in central Bedfordshire. The next Parish Council meeting will be held on Monday 5th November 2012, from 7.30pm, in the Coffee Tavern. "My eyes are dim, I cannot see, I have not brought my specs with me". Words remembered from, I think, an old 2nd World War song. The Lord says "You will open the eyes of the blind and set free those who sit in dark prisons." Isaiah 42: 7. How fortunate are we, those of us who can see? Not many of us have perfect sight. I have recently had one of my cataracts removed; and am in the queue for the sight of my other eye to be improved. What a difference the operation made; the faces of people on the television screen became clearer, colours were brighter, I could read the road signs as I approached them when driving,...but...I can't see to read properly, because the eyes now don't work well together and I am not to have new 'specs' until the other cataract is removed! But that really is not for much of a hardship. Our Father God has a special kind of love for the afflicted. The song writer Annie Johnson Flint put it well when she wrote: "To added afflictions He addeth His mercy." A lady who went totally blind at the tender age of four was asked what colours meant to her. She said "texture and taste. Red is warm and velvety. Green is wet grass smell, it is restful. Blue is like water. Yellow has a sound; that of laughter. Violet is soft and quiet. Purple is dark, intense. Orange is loud, shouting, like the smell of the fruit, full of zest, a banner of colour. Brown is the smell of leather. White is the colour of summer. Black is like night, giving the comfort of a warm blanket and assurance. Grey,.. I don't like grey, it's an inbetween colour; like a dull, rainy day, waiting for the sun to shine again." How favoured we are to have healthcare. Saul, on the way to Damascus was blinded by the Light of the Lord, his companions took him into the city, some three days later, days in which he neither ate or drank, he was visited by a man, a disciple of Jesus, who said to him "Brother Saul, receive thy sight". The whole purpose of Saul's life was now permanently changed. You can read his story in Acts 22. What a difference those days made to him; he turned from doing evil to doing good. Our sight is a gift from God, not a fringe benefit, a gift that makes joy possible. One cannot but help add that there many more gifts to be had from Him. If you love and serve the Lord He will continually add His blessings. There are occasions in our spiritual experience when it is necessary for us to take off our spectacles and look at ourselves with true eyes. There was darkness in the world when Christ was crucified, there is still darkness today. He died because dimmed and blinkered eyes could not see what was happening and so sat back and did nothing. There is ugliness, sin, depravity and injustice still in our world today. We are responsible for this world, and each other. "Courage, brother! do not stumble, though thy path is dark as night; there is a star to guide the humble; trust in God and do the Right." We have had a few reports over the last 24 hours that there are loft insulation scammers working through the village. They have visited several people in the village with no ID or knowledge of the company they work for making cold calls asking to check people's loft for insulation. Fortunately, these people have been vigilant, but residents should be aware, especially pensioners and their families, to be on their guard and not to buy anything based on a cold-call. If you think you have been a victim of this or a similar scam and would like advice on your rights please call Consumer Direct on 0808 156 2259, or you can call local police on 101. The clapper-board snapped shut in front of the camera, as I hovered behind the fi lm crew. It wasn't exactly Leavesden Studios, but I was still pretty excited! Every now and then we all see cameras and lighting equipment and wonder what's going on. This occasion, up at Edlesborough church in mid-June, was the making of a short film accompanying an original song by a local artist – Soffia Osk. Soffia is an 18-year old singer-songwriter, originally from a tiny fishing village in Iceland, who moved to Beaconsfield a few years ago, and attended Berkhamsted School. The video was made by volunteers, using the song as a backdrop to its story. I knew Soffia from school so I went up to the church and helped out with a few odd jobs on the filming: making cups of tea; fashioning the daisy chains, (an important part of the storyline); making a hundred cheese and tomato toasted sandwiches; and generally trying to stay out of shot! Watching the film being made was a fascinating process, but what surprised me most was the hours and hours of waiting around – you don't see that on the DVD extras. And so that was my Edlesborough film-making experience. Next time I drive past a camera crew I will be reminded of a day spent making daisy-chains, toasties, and a lot of hanging around. If you want to see scenes of the village and the church you can watch the video on YouTube (embedded below) – just search for Soffia Osk; the video is called 'God I Love You'. The song has also just been released as a single - a local/Icelandic connection! The dust has settled – or maybe I should say that the scars left in the Green have almost healed – and we can say goodbye to Carnival 2012. It is a day that is fast fading into the memory, but one that was marked by some of the heaviest rainfall seen in the village for some time. Fortunately the downpour was short and sharp and the afternoon stayed clement – enough so that we were able to pack everything away dry and safe for another year. I hope that some of you have seen the information on the Church Notice Board that the Organising Committee raised a remarkable £12,500 – only £500 less than 2011's record. I therefore need to say a huge 'Thank you' to everyone who helped in any way in advance of Carnival, on Carnival day and afterwards to achieve such a total and especially to the Organising Committee who work so hard to make St Mary's Village Carnival such a wonderful community event. Sadly the committee is saying goodbye to Bernie Hillman and Mark Saccoccio who have both given years of valued service. 'Thank you, both' and I'm sure you will both continue to make an important contribution in the future. I also want to thank Edlesborough Cricket Club and Edlesborough Council (especially Kevin Cubbage) for their co-operation and patience in ensuring that damage caused to the Green by someone's spiteful behaviour was addressed and resolved very quickly and with a minimum of rancour. 25% to a principal charity – this year 'The Chemotherapy Unit at Luton & Dunstable Hospital'. 25% distributed among local (or locally connected) good causes, in line with commitments resulting from the Carnival or as requested by people in the villages. So now we turn to Carnival 2013, which will be my twelfth as Chairman of the Carnival Committee and 25th year as a Committee member and during which time just under £¼ million has been raised for local good causes. As you can imagine, with three signifi cant milestones for me I hope Carnival 2013 will be as splendid as ever. The theme will be 'SciFi' so, hopefully, there will be lots of scope for colour. But Carnival does rely on YOU. Please, if you will feel you have a contribution to make to the success of our Carnival, get in touch with me. We need new Committee Members, people to help make the event run smoothly, offers of prizes, advertisers, offers of transport etc. ; maybe you have no more use for a frame tent that you could lend or give to us. Carnival is an event for our community of which the community is rightly proud. Please contact me with your offers of help. Our Cafe Community Lite Lunches will start again on SATURDAY OCTOBER 13th from 11-00 am until 1-00pm. We invite you to join us for a friendly and relaxing time for just a coffee or tea or a lite lunch which ever you prefer. Our charity for any donations we are given, at our Lunches in October and November will be given to FARM CRISIS NETWORK whose Chaplain is Rev. Coralie McCluskey from St Mary's Church E.B. There will also be a table of knitted garments available for sale in October that some of the ladies from our Chapel have kindly made. Cafe Worship on Sunday October 14th will be led by Belinda Freeman. Thank you Eaton Bray and Edlesborough Lions for your wonderful idea of a monthly fish and chip supper… delivered. I joined the scheme and received my first supper on27th July. It was piping hot, beautifully cooked and of very generous proportions! The Lions were happy, friendly and took time to explain their society code when callingat the door. So in this patriotic year, during which we've waved flags (Union Jacks) for the Queen's Golden Jubilee and cheered on the Olympians, now wave your flag yet again for that other great British institution, the fish and chip supper! So, get your "skates" on and "plaice" your orders, you "cod" be in for a wonderful supper that would surely "rock" your boat! If you need a reminder of the number tocall to order: 01525 229656 and you'll certainly be "batter off"
The Village Sign is being designed to commemorate the Queens Diamond Jubilee 2012. 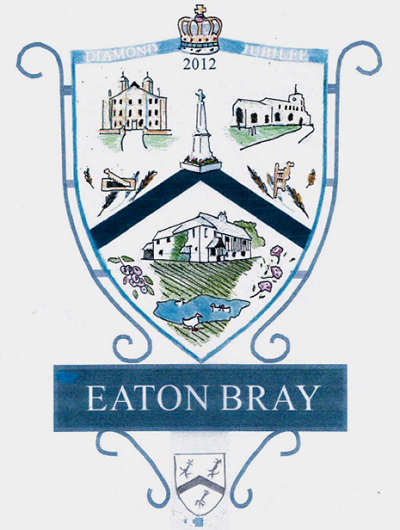 It is a shield based on the Bray family's Coat of Arms and depicts scenes from Eaton Bray past. More details about the design can be found on page 12 in the August/September 2012 Focus, and also here: The Eaton Bray Village Sign. It is proposed to place the sign on the green outside the front of the White Horse Public House. 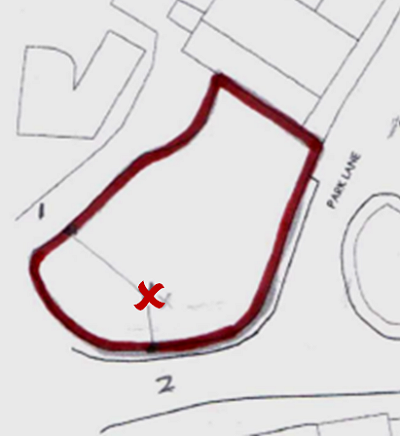 Area depicted by a red cross on the plan below. During the Carnival, Macmillan Cancer Support held a fundraisng Charity Balloon Race. After careful scrutiny the winner has been declared. We are very pleased to announce that Phoebe Dent, a young resident of Northall, had the winning balloon and has received her prize from Macmillan. The kind person who returned the label has also received a prize. We would like to thank everyone who supported the charity at the carnival and at our other events. Your contributions go a long way to helping people living with cancer and their families and carers. Hello everyone, we hope you have enjoyed the last couple of months. The Olympic athletes were a joy to watch and gained so many medals. We should be proud of them. Apologies for the August walk date but the entry had already been sent when the date was changed to August Bank Holiday Monday, the 27th. The group started the walk in Ashridge with high hopes for decent weather. Unfortunately there was a heavy rain fall and the group decided to return to the starting point at The Bridgwater Arms, disappointed but good humoured. The trip to The Shuttleworth Collection on 12th July was enjoyed by all who went. Thanks go to Brian Wyke who arranged such a busy, full day. We were blessed with fi ne weather for the Cream Tea in Val and Alan's garden on 16th July. Thanks to them for allowing us all to enjoy their garden. Also to Viv for the lovely scones and to Audrey for the excellent jam which tasted good with the cream. Vic led the walk on July 23rd and it was completed in fi ne weather. The walk started at Whipsnade Church, continued past Kensworth Quarry, over the face of Dunstable Downs, past the Tree Cathedral and back to the start. Lunch was enjoyed at The Hunters Lodge. Dr Martyn Jones retired as a General Practitioner from the surgeries in July 2012 after many years of hard work and dedication to the local communities. He started the practice from his home on 1.2.1985. As the patient numbers grew, he progressed by building the two purpose built premises, which opened in Pitstone on 1.7.1991 and Edlesborough on 1.4.1992. Today the practice is continuing to grow and develop. He will be missed enormously by patients and staff alike and we are sure you will want to join us in wishing him every good wish for a very long, healthy and happy retirement. There is a book in reception if you would like to add a message in recognition of the care he has given you over the years. You are viewing the October 2012 archive.